Forestry Training Services provides a variety of forestry and tree-related educational seminars and certification services. 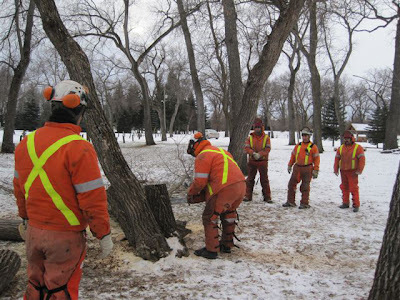 Ken Fosty, Accredited Workplace North Chainsaw Safety Instructor, is a fully licensed and insured Certified Arborist with over 39 years of professional experience in the forestry field. Ken has combined his professional and instructional expertise in delivering educational seminars throughout Canada. Ken is a Certified Professional Chainsaw Instructor and provides chainsaw safety certification training to numerous groups including industry, landowners, utilities, First Nations, Inuit and Metis. He is also a certified Manitoba Provincial Lumber Scaler as well as a Non-Timber Forest Product Instructor providing instructional presentations on numerous wild crafting topics including wreath making and herbal teas. He manages his woodlot in Southeast Manitoba. He uses his woodlot as his hands-on laboratory to grow Christmas trees, produce firewood, cultivate trees and shrubs, produce maple and birch syrup and grow nutritious organic mushrooms. All of the sessions are aimed at novices or more experienced people who are ready to hear the latest information. Some sessions may be eligible for Canadian Agricultural Skills Services (CASS) funding and International Society of Arboriculture (ISA) credit where applicable.